Do you really need a veterinary nutritionist to feed your dog a homemade diet? Four veterinarians from the School of Veterinary Medicine at the University of California, Davis, published a study in the June issue of the Journal of the American Veterinary Medical Association, entitled Evaluation of recipes of home-prepared maintenance diets for dogs. I don’t think anyone will be surprised to hear that their findings were not exactly positive. The authors have a vested interest in opposition to any homemade diets prepared without the help of a veterinary nutritionist. Disclosed in the study is the fact that three of the authors are part of the veterinary college’s Nutrition Support Services, and one of those is an owner of DVM Consulting, Inc., the company that manufactures Balance IT, a supplement that is used extensively by veterinary nutritionists to balance limited-ingredient homemade diets. The company was founded by Sean Delaney, DVM, MS, DACVN (board certified veterinary nutritionist), who also held an academic faculty position at UC Davis from 2003-2013. The study analyzed 200 recipes. Of those, 133 were obtained from 2 veterinary textbooks and 9 pet care books (two of which were also written by veterinarians), and the remaining 67 recipes came from 23 different websites. Of all the recipes analyzed, 129 were written by veterinarians, and 71 by nonvets. There are many nits I could pick with this study, but bottom line, I think the authors have a point. 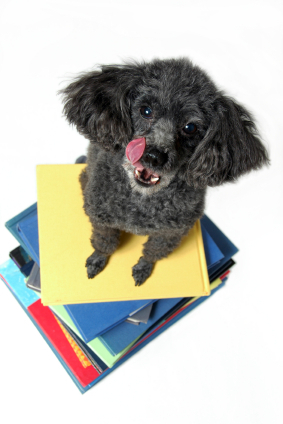 Most home-prepared dog food recipes (in books and online) are incomplete, many seriously so. Instructions are often so vague that it’s impossible to determine a recipe’s nutrient content. For example, recipes may include “ground beef” without specifying the percentage of fat. Similarly, many recipes use “chicken,” without denoting dark meat or light meat, or whether skin is removed. When grains are used, some recipes do not state whether the amount given is before or after cooking. These factors greatly affect the caloric and nutritional value of the recipes. And of those that tell you to add supplements, many just say, “add a complete and balanced vitamin-mineral supplement,” with no further guidance. Others may tell you to use a specific amount of bone meal, without recognizing that different brands can vary considerably in how much calcium and phosphorus they contain. And, in general, those are some of the better books – at least they’re telling you to add calcium and supplements. Many recipes don’t include either. When I analyze home-prepared recipes at the request of dog owners, I’m not concerned that the diets meet NRC guidelines exactly, but they should be in the same ballpark. Nutrition is not an exact science. I was suspicious that the study could easily claim that almost no recipe met every single guideline exactly, but if the deficiency is slight, I don’t consider that a concern. For example, 61 percent of recipes were low in vitamin D*, and 95 percent of those provided less than half the NRC recommended amount. Zinc, copper, choline, and EPA/DHA were also short in more than half the recipes. Of those that were deficient, 55 percent had less than half the recommended amount of zinc, 43 percent had less than half the recommended amount of choline, and 39 percent had less than half the recommended amount of vitamin E. In other words, those recipes were significantly deficient in these nutrients, not just a little bit short. ● Vitamin E was short in every recipe I’ve analyzed, unless supplements are added. NRC recommends just 7.5 IUs per 1,000 calories. It’s okay to give more, but see Vitamin E for my current recommendations on vitamin E supplementation. ● Zinc was at least a little short in most of the recipes I’ve analyzed. Significant amounts of zinc are found in red meat, with lesser amounts in pork and poultry. Turkey has more zinc than chicken, and dark meat poultry has more zinc than light meat. Organ meats, particularly liver and heart, provide substantial amounts of zinc. Egg yolks are also a good source of zinc. Diets that rely primarily on chicken, or that do not include organs, are likely to be significantly short on zinc. NRC recommends 15 mg zinc per 1,000 calories. ● Choline, a member of the B vitamin family, is often short in recipes I analyze, although this is partly due to the USDA database not always providing data on this nutrient. Eggs are one of the best sources of choline, with one large egg providing 126 mg. Liver, particularly beef liver, is very high in choline, with almost 100 mg per ounce. Heart and kidney are also high in choline. Diets that do not include eggs and organs will be short on choline. NRC recommends 425 mg choline per 1,000 calories. This nutrient is hard to supplement, as most B-complex vitamins and multivitamins provide little or none (Nature's Farmacy offers Choline supplements). Sources include lecithin granules with 217 mg/Tbsp and brewer’s yeast with 63 mg choline/Tbsp (nutritional yeast has less). Both lecithin and brewer's yeast add about 50 calories per tablespoon as well. ● Copper is plentiful in beef liver, which has 2.7 mg copper per ounce. Chicken, turkey, and pork liver provide little copper, so diets that do not include beef liver are always low in copper (duck and lamb liver are also high in copper). I recommend feeding about one ounce of liver (at least half of which is beef liver) per pound of other meat. NRC recommends 1.5 mg copper per 1,000 calories. ● Calcium: 35 percent of the recipes analyzed were short on calcium. This was likely due to the multitude of recipes that do not include a calcium supplement. All homemade diets require added calcium, in amounts greater than a multivitamin will provide, unless you feed raw meaty bones that are fully consumed. NRC recommends 1,000 mg calcium per 1,000 calories for adult dogs. ● B vitamins: Vitamins B1 (thiamin), B2 (riboflavin), and B5 (pantothenate) were short in 14.5, 40.5 and 27 percent of recipes, respectively. Cobalamin (vitamin B12) was also short in many recipes, but since most dogs can make their own cobalamin (deficiency has only been linked to poor absorption due to genetic abnormalities or small intestinal bacterial overgrowth, rather than to dietary deficiency), I’m not as concerned about it. Most recipes met the rest of B vitamin needs. Thiamin is found primarily in legumes (beans, lentils), fruits, vegetables, and grains, so diets that omit these foods are likely to be short. Nutritional yeast is very high in both thiamin and riboflavin (brewer’s yeast has quite a bit less). Riboflavin is also found in vegetables, as well as mushrooms, yogurt, and eggs. I was surprised that pantothenate was short in so many recipes, as I almost never see that. Pantothenate is found in the same foods as thiamin, as well as egg yolks and meat, especially liver. NRC recommends 0.6 mg thiamin, 1.3 mg riboflavin, and 3.75 mg pantothenate per 1,000 calories. ● Linoleic acid (omega-6 essential fatty acid): Found primarily in poultry fat and plant oils, so diets that include little poultry, or that use only skinless breast, which has little fat, will be deficient in linoleic acid without added plant oil. NRC recommends 2,800 mg linoleic acid per 1,000 calories. That amount would be provided by ½ tablespoon corn oil, soybean oil, walnut oil, or hempseed oil. It would take 1 tablespoon of canola oil, 1.5 tablespoons of safflower oil, or 2 tablespoons of olive oil to meet NRC recommendations. Six ounces of chicken breast with skin or ground turkey with 8 percent fat, or twelve ounces of dark meat chicken with skin and separable fat removed, will provide this much linoleic acid (based on raw boneless weights). ● Selenium: Just over one-third of recipes were found to be short on selenium. Fish, meat, and eggs are good sources of selenium, though the amount of selenium in foods can vary. Most of the recipes I’ve analyzed contained close to the recommended amount of selenium, which is 88 mcg per 1,000 calories. As an alternative to these food sources, giving the dog a human one-a-day type of multivitamin can help to make up for most deficiencies (not including calcium, essential fatty acids, or choline). You can give the full adult human dose to dogs weighing 40-50 pounds, half the human dose to dogs weighing 20-25 pounds, or one-quarter the human dose to dogs weighing 10-12 pounds. Larger dogs would get proportionately more. This approach won’t work for really small dogs, as the dosage would be too high. Also, iron is often high, and copper sometimes low, in these supplements. The study addressed the issue of “balance over time” by analyzing three groups of seven recipes (all from the same source), but found that even if a variety of recipes were used, they were still deficient in most of the nutrients listed above (14 nutrients had inadequate concentrations in at least 50 recipes). Even if you vary ingredients, homemade diets are likely to be lacking if you leave out important food groups such as fish, eggs, or liver, or if you rely too much on one protein source, such as chicken or beef. Some supplements, such as calcium and vitamin E, are always needed when you feed a homemade diet. Others will be needed if you omit any of the following food groups from the diet: red meat, poultry (including some fat), fish, eggs, liver, dairy, vegetables, and fruits. I’ve often said that you don’t need a degree in nutrition to feed your dog a homemade diet; if we can feed ourselves and our children, we should be able to feed our pets as well. That said, dogs have unique nutritional needs that vary from human requirements; they need more calcium for their weight than we do, for example. Also, many people get in a rut when feeding their dogs a homemade diet, and may feed the same limited recipe for long periods. While veterinary nutritionists are unlikely to formulate a home-prepared canine diet that is deficient in essential nutrients, they are very likely to formulate a diet that is heavily carbohydrate-based, relies on plant-sourced oils for dietary fat, and obtains most of its vitamins and minerals from synthetic, not food-based, sources. In other words, the diets they create are not ideal, either! A small amount of one type of lean meat, e.g. skinless chicken breast, for protein and amino acids. A large amount of one type of starchy carbohyhdrate, e.g., white rice, used to provide calories. Corn or canola oil, providing calories and fat (particularly omega-6 fatty acids). Balance IT, or a number of other supplements, used to meet most nutritional requirements. There are several problems with this approach. I believe that higher-protein diets provide many benefits to the body, including the immune system, nervous system, skin, and coat. Diets with more meat and fewer carbs help to build lean muscle rather than being stored as fat. Plant oils are more likely than animal fats to become rancid, contain hydrogenated trans fats, and be genetically modified. Every five years, the U.S. Department of Agriculture (USDA) and the Department of Health and Human Services (HHS) jointly update and issue a document called the "Dietary Guidelines for Americans." These guidelines make it clear that a human's nutritional needs should be met primarily through diet rather than supplements. Whole foods offer three main benefits over dietary supplements: greater nutrition from the micronutrients they contain, dietary fiber that can help with digestive disorders, and protective substances, such as antioxidants and phytochemicals. These factors apply to dogs as much as they do to humans. People who feed their dogs a homemade diet usually want to improve nutrition through the use of fresh foods, rather than feeding highly processed commercial diets that rely on a long list of synthetic nutrients in order to meet nutritional requirements. Recipes from veterinary nutritionists are the homemade equivalent of poor-quality kibble, not the varied, fresh food diet that owners would like to feed their dogs. Why can’t veterinary nutritionists design recipes that meet most nutritional needs through the use of whole foods, rather than synthetic supplements? Why can’t they accept that most people and dogs prefer variety rather than always feeding exactly the same thing every day? And why do they insist on using skinless chicken breast with added plant oils, rather than feeding dark meat chicken (or breast with skin) that would meet omega-6 fatty acid requirements without having to add plant oils? As long as veterinary nutritionists think that a diet should consist only of the barest amount of fresh food propped up with synthetic supplements, people are going to continue to turn elsewhere for diet advice for their pets. It’s a shame that so many of the books and online resources that purport to provide that advice fail so miserably. Ideally, nutritionists would learn how to create complete and balanced diets that rely on fresh foods rather than supplements to meet most nutritional needs, and recognize the benefits provided by high-protein, meat-based diets (rather than just meeting minimal protein requirements). Update 2018: I am pleased to say that Balance IT has improved their recipes considerably since this article was written, offering a wide variety of foods and supplements to choose from and allowing you to tweak the amount of protein, fat, and carbohydrates in the recipe, within limits. I suggest choosing recipes with higher protein (or increasing the amount of protein as much as the recipe calculator will allow) for most dogs. Watch out for recipes that provide more than about 300% of the requirement of minerals, as shown on the Nutrient Profile (this is not a concern for amino acids or vitamins). Remember that there is no need to avoid grains or other carbohydrates completely; just don't make them a large proportion of the diet (15-25% of calories from carbohydrates is fine; more is acceptable if needed to keep costs down). I also recommend adding fish oil even if the recipe doesn't require it, as the omega-3 fatty acids in fish oil are only considered a requirement for puppies, but will benefit all dogs. * The recommended amount of vitamin D published in the study was incorrect: the article shows 339 IU for the NRC RA, which is actually 136 IU. A correction is due to be published in JAVMA in July 2014. The authors claim that this figure is a typo, and that they used the correct amount in their research and conclusions, but unless they are willing to release their raw data, there is no way to verify this or to know if their claims about vitamin D being short in most recipes are valid. These veterinary-developed meals use more whole foods to meet nutritional requirements..
News item by Mary Straus, published in the Whole Dog Journal, December 2013. Three months ago, I asked, “Why can’t veterinary nutritionists design recipes that meet most nutritional needs through the use of whole foods, rather than synthetic supplements?” The question appeared in my article “Dishing on Diets,” (WDJ September 2013), about a study claiming that most homemade diet recipes are incomplete and unbalanced. I pointed out that most veterinary nutritionist recipes consist of minimal whole foods and rely heavily on supplements to meet nutritional needs. My (secret) hope was to plant a seed that might someday bear fruit, but I didn’t realize that my challenge had already been met. JustFoodForDogs was started almost three years ago in Newport Beach, California. The company is led by Dr. Oscar Chavez, DVM, whose focus has been clinical nutrition since graduating from the Royal Veterinary College in London. Dr. Chavez was director of the Animal Health Science veterinary technology program at California State Polytechnic University, Pomona, from 2010-2013, and he remains an adjunct professor of canine clinical nutrition there. Dr. Chavez is also a member of the American Academy of Veterinary Nutrition. JustFoodForDogs offers cooked, frozen JustDailyMeals, made from high-quality whole foods free of hormones, preservatives, and artificial colors and flavorings. These meals include meat or fish, organs, vegetables, fruits, and oils, along with potatoes and sweet potatoes in their grain-free recipes, and white rice, brown rice, and macaroni in the rest. The company says that all ingredients, including supplements, are USDA- or FDA-approved for human consumption. All these meals have plenty of protein, but the amount of fat varies widely, from low-fat fish to higher-fat lamb and beef. Delivery is available in parts of southern California, or foods can be shipped anywhere in the U.S. The cost ranges from $3.60 to $6.74 per pound, plus shipping. Instead of using the same vitamin and mineral blend for all foods, JustFoodForDogs customizes a blend specific to each recipe. This is highly unusual in the pet food market; most companies use the same supplement premix for all their foods, as it’s more economical. The downside of using the same supplements for all foods is that there may be far more than is needed of some nutrients, and ratios may not be properly balanced. Note that the nutrient guidelines established by the Association of American Feed Control Officials (AAAFCO) and the National Research Council (NRC) do not require specific ratios other than calcium:phosphorus, and their maximums allow for a very wide range of nutrients. For example, beef and lamb liver are high in copper, so there’s no need to add copper to recipes that include either of those, but poultry meat and organs have little copper, so copper must be added to poultry-based diets. If the same premix is used for all foods, those that include beef or lamb liver will have more copper than is needed, which will upset the ideal 10:1 ratio of zinc to copper. A study published this year in the Journal of the American Veterinary Medical Association found increased copper accumulation in the liver of Labrador Retrievers, both with and without liver disease, most likely the result of increased exposure via their diets. This may be a side effect of feeding foods with more copper than is appropriate. As another example, I’ve seen recipes that rely on Balance IT (a vitamin/mineral supplement used extensively by veterinary nutritionists) where twice as much of the supplement as would otherwise be needed was prescribed in order to ensure that there was more calcium than phosphorus in a recipe relatively high in meat (apparently Balance IT's program doesn’t have an option for adding additional calcium separately). The only other companies I know of using individualized supplement blends are Darwin’s Natural Pet Products and Raw Bistro Pet Fare. Both companies consulted with Steve Brown (founder of Steve’s Real Food for Dogs and See Spot Live Longer Homemade Dinner Mixes, and author of Unlocking the Canine Ancestral Diet), who insists on customized supplement premixes for the companies he works with, to ensure that their frozen raw foods are complete and balanced. I was delighted to see that the company also offers JustDoItYourself kits, which include the recipe for each Daily Meal, along with their customized nutrient mixture, so that you can make the same meals yourself at home. The cost per kit, enough to make about 30 pounds of food, is $18 (shipping is free). JustFoodForDogs also offers Vet Support Diets, designed for dogs with kidney disease, liver disease, cancer, digestive disorders, pancreatitis, fat intolerance, and allergies. I was pleased to see that their kidney diets are not overly restricted in protein, while still being low in phosphorus (see Is a Low-Protein Diet Desirable or Necessary for Dogs with Kidney Disease for more information as to why this is desirable). All of the Vet Support diets except their ultra-low-fat Balanced Remedy require a veterinary prescription. Unfortunately, the company does not currently offer JustDoItYourself kits for their Vet Support Diets, but may consider doing so in the future through veterinarians. Not all dogs are willing to eat home-prepared meals with spoonfuls of added supplement powder, which change the smell and taste of the food. Another benefit to using whole foods to meet more of a dog’s nutritional requirement, and to using customized supplement blends, is that less supplement powder is added to the food. Minimizing supplements makes the food more palatable, especially for sick dogs whose appetite may already be compromised. The company will also design customized diets for dogs with health problems, including an individualized nutrient blend designed to make the recipe complete. Health issues commonly addressed include obesity, digestive disorders, pancreatitis, diabetes, liver and kidney disease, and more. A blood panel from your vet is typically required. There is a one-time fee of $195 to cover the cost of formulating the recipe and nutrient blend. You can then choose to have the company make the food for you, or you can buy the supplement mixture and the recipe to make yourself at home. This is a much improved option for those whose dogs have health issues than the typical recipe created by a veterinary nutritionist. It’s also likely to be more palatable for your dog with more real food and less supplement powder per meal. JustFoodForDogs offers other supplements and treats, including what the company claims is USDA dehydrated chicken breast, a safer option than the vast majority of chicken jerky products on the market that use chicken imported from China and have been linked to kidney failure in dogs. Finally, I applaud the company’s unique use of humane feeding trials using dogs living in family homes rather than the typical research environment. Cal Poly Pomona helped to develop feeding trial protocols that meet AAFCO guidelines, considered the “gold standard” for proving nutritional adequacy. The study tested their daily recipes over a six-month period, with all participants passing with flying colors. The “nutrient profiles” that define what constitutes “complete and balanced” diets for dogs will change next year (2014). When buying food for their dogs, owners depend on the product manufacturers to deliver a “complete and balanced” diet in those bags, cans and frozen packages. Perhaps without even being aware of it, owners also understand that there are government agencies responsible for setting standards as to what constitutes a “complete and balanced diet” for dogs, and for making sure that pet food makers meet those standards. We count on manufacturers and regulators alike to “get it right” so we can feel confident that our pets are getting everything they need, in just the right amounts. So, it’s a bit disconcerting to learn that the three most important players in the setting of those nutritional standards have made changes to the nutrient lists and nutrient levels in recent years – and that each organization’s recommended nutrient “profiles” or “guidelines” differ from the others in some significant ways. The Association of American Feed Control Officials (AAFCO) is the arbiter of American pet food’s “nutrient profiles” – a table of all the vitamins, minerals, protein and its constituent amino acids, and fat and its constituent fatty acids that are needed (and a minimum amount or acceptable range for each nutrient). AAFCO’s ingredient definitions and nutritional guidelines are developed with substantial input from the pet food industry, such as the Pet Food Institute (PFI, a lobbying organization for pet food companies), American Feed Industry Association, National Grain and Feed Association, and the National Renderers Association. Academia plays a role, too, as lots of nutrition research (often funded by pet food companies) is conducted at universities with agricultural and/or veterinary departments. Industry representatives are non-voting advisors to the committees who set the standards. AAFCO itself has no regulatory authority; it’s up to states to adopt and enforce the AAFCO model regulations of feed ingredients and nutrient guidelines as laws. The NRC substantially revised and updated its “Nutrient Requirements for Dogs and Cats” in 2006; the previous version was published in 1985. AAFCO has been revising its own guidelines, and expects to publish the updated “Dog and Cat Food Nutrient Profiles” in 2014, presumably with a grace period before companies must comply with the changes. Additional changes scheduled to be put in place around the same time include requiring all pet food labels to provide information on calories, and adding new minimum requirements for omega-3 fatty acids for growth and reproduction. Both AAFCO and FEDIAF relied at least in part on the NRC guidelines, yet there are substantial differences between the recommendations of the three groups. Pet foods sold in the U.S. that display “complete and balanced” on their labels must meet AAFCO requirements, while those that are also sold in Europe must meet both AAFCO and FEDIAF guidelines. Exceptions are made for foods that use feeding trials to prove nutritional adequacy, or meet product family criteria (where foods that are substantially similar to another food made by the same company do not have to be separately tested). There is no requirement that any foods comply with NRC recommendations. As a percentage of food on a dry matter (DM) basis. This value is complicated by the assumption that the food has a particular energy density. As an amount per 1,000 kilocalories (kcal, or what is commonly referred to as calories). NRC calculates nutrient values for calories based on the needs of a healthy, active dog, not the calories a dog actually consumes. A dog’s nutritional needs are not reduced when he consumes fewer calories as he gets older or slows down. As an amount per body weight of the dog. Body weight is computed to the ¾ power, a mathematical computation that accounts for the fact that large dogs eat less for their weight than small dogs do. That critical step, however, is often overlooked or ignored when people talk about nutrient requirements based on body weight. In addition, these guidelines should be applied to a dog’s ideal weight, not actual weight. An obese dog does not require more nutrition than a dog of proper weight, nor does a thin dog need less. Each of these methods will produce the same results if the energy density is accounted for and the caloric requirement is calculated based on the ideal body weight of a healthy, active dog. NRC provides nutrient guidelines presented in all three ways, while AAFCO and FEDIAF use only the first two methodologies. FEDIAF increases many NRC values by 20 percent to account for its assumption that pet dogs need fewer calories than what NRC calculates. To make comparisons even more difficult, different units of measurement are used with some nutrients. For example, NRC shows vitamin A recommendations in RE (retinal equivalents), vitamin D in micrograms, and vitamin E in milligrams, while AAFCO and FEDIAF both use international units (IU) for all three. Complicated conversions are required in order to compare the different units to each other. The “recommended allowance” is not meant to be an ideal amount, but rather takes into account practical considerations of formulation and ingredients, and is therefore the most appropriate category to use for comparison to AAFCO and FEDIAF. AAFCO provides only a recommended minimum amount, and, in many cases, a maximum amount. FEDIAF does the same, but also includes some maximums based on European laws. Surprisingly, NRC does not show a safe upper limit for most nutrients, including some that are known to be toxic in high amounts, such as zinc and iron. When units per 1,000 kcal are compared between the three agencies, many of the recommendations are identical, and others are close enough that any differences are probably due to minor conversion and rounding discrepancies. This likely reflects both AAFCO’s and FEDIAF’s reliance on the NRC guidelines. But some values are markedly different. Some discrepancies can be explained by the difference in life stage groupings. For example, AAFCO and FEDIAF may choose to use NRC’s recommended allowance for young puppies for their “growth and reproduction” category, even though NRC’s recommendations for lactating females may be higher. Other cases are not readily explainable. NRC’s recommended protein amount for adult dogs, for example, is just 10 percent protein on a dry matter basis, which is extremely low. Fortunately, both AAFCO and FEDIAF use more moderate values, requiring a minimum of 18 percent protein (DM) for adult dogs. Varying calcium levels are similarly inexplicable. NRC gives a single acceptable range of calcium per 1,000 kcal for growing puppies after weaning, while FEDIAF has different ranges for puppies before and after 14 weeks of age, plus separate categories for puppies in the older group, based on whether their anticipated adult weight is below or above 15 kg (33 pounds). The FEDIAF’s more comprehensive guidelines appear to reflect knowledge gained in the last two decades of how excess calcium causes bone and joint abnormalities in large breed puppies, who are especially vulnerable prior to the age of about six months, but that doesn’t explain why the NRC does not account for the greater risk of too much calcium in this group. Study finds genetic differences between dogs and wolves, with dietary implications. Domestication appears to have led to genetic changes in dogs that make them able to digest starches better than wolves can, according to a paper published in the journal Nature in January 2013. Kerstin Lindblad-Toh, a geneticist at Uppsala University in Sweden, led the team that looked for genetic differences between the genomes of 12 wolves from around the world and 60 dogs from 14 different breeds. They found 36 areas in the genome where dogs differed from wolves, but not from dogs of other breeds, indicating changes likely linked to domestication. Nineteen of the regions found involve the brain, and 8 of those are involved with nervous system development that could help to explain behavioral changes that make dogs friendlier, less fearful, and less aggressive toward humans. Another 10 genes were found to help dogs digest starches and break down fats. The researchers believe that 3 genes in particular make dogs better at splitting starches into sugars and then absorbing them in the gut. Interestingly, most humans have also evolved the ability to more easily digest starches in what appears to be a case of parallel evolution. The researchers suggest that the adaptations in both species are likely linked to the development of agriculture about 10,000 years ago. These new findings help to support the theory that dogs may have become domesticated by hanging around human settlements and scavenging their scraps and waste. The study does not rule out the possibility of earlier domestication, however, which is supported by fossil records that may go back 33,000 years, or of later interbreeding with wolves. Another scientist plans to analyze fossil DNA to try to discover when these changes first appeared. Changes in digestion may have developed after behavioral changes that could have occurred much earlier, when our human ancestors were still hunter-gatherers. 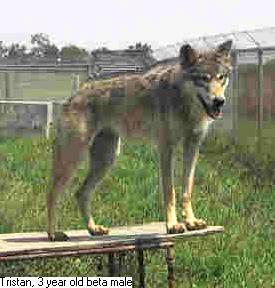 In 1997, I attended a seminar at Wolf Park in Indiana, where I learned that wolves cannot digest starches very well and require a high-meat diet in order to thrive. The wolves at Wolf Park are fed primarily deer carcasses, but when those are in short supply, the wolves are given Nebraska Brand carnivore diets that are mostly meat with very little carbohydrate content, rather than dog food. Since wolves consume almost no starch, a diet that is relatively rich in starch does not mean that grains and other starchy foods would (or should) make up the majority of the diet. It also does not mean that dogs require starches in their diet, and it does nothing to support feeding a highly processed diet rather than fresh foods. The parallel evolution involving starch digestion in humans and dogs could also help to explain similarities in certain diseases, including diabetes and inflammatory bowel disease, indicating that there might be drawbacks as well as advantages to eating diets that are high in starch. The flip side is that I do think this study supports the idea that it’s acceptable to include some starch in your dog’s diet, as long as it doesn’t cause problems for an individual dog. For example, I feed my own dog a homemade diet that is high in protein, but I also include carbohydrates in the form of vegetables, fruits, and even grains (she gets a meal of cereal, yogurt, and banana for breakfast every fourth day). I don’t believe it’s necessary or even advisable to avoid starches altogether unless you have an individual dog who reacts badly to them, and even then, your dog may do well with some starches, even if she has problems with others. Whole grains are high in some vitamins and minerals and provide fiber (prebiotics) that helps to support beneficial bacteria in the intestines (probiotics). Other starchy foods, such as potatoes, sweet potatoes, and bananas, also provide nutrients that may otherwise be lacking in a homemade diet. I continue to believe that the majority of dogs thrive when fed a diet that is high in protein, with low to moderate fat and carbohydrates, depending on the individual dog’s needs and response. Starches can be particularly helpful for dogs who need to gain weight, or who require reduced fat or phosphorus in their diets. Their inclusion can also help to reduce the cost of feeding a homemade diet. The study also found a variation between dogs in the number of duplicate genes involved in the production of amylase, a pancreatic enzyme required for the first step of starch digestion. While wolves had 2 copies of this gene, called AMY2B (one of the three genes identified above), researchers found a range of 4 to 30 copies in the dogs they studied, indicating that some dogs (and possibly some dog breeds) are better at digesting starches than others. As always, it’s important to do what works for your dog. If your dog has digestive issues when consuming a diet that is high in starch, or shows signs of inflammation, such as from allergies or arthritis, it’s worth trying a low-starch diet or even eliminating starchy foods completely to see if improvement is noted. 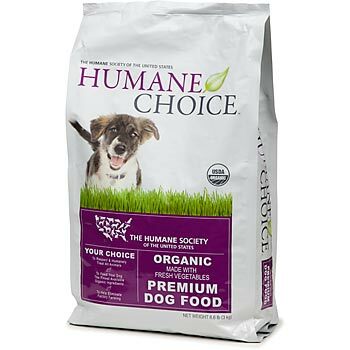 In February, the Humane Society of the United States (HSUS) entered the pet food market with its “Humane Choice” brand of organic vegetarian dog food. According to the product’s marketing materials, the impetus for the move was “to give pet guardians an option to feed their dogs a complete and balanced food that is also sustainably grown and helps us in our work to combat inhumane factory farm practices.” Those are some great (and disparate) goals – but is this a good choice for your dog? We don’t think so, for a number of reasons. We’re skeptical about vegetarian diets for dogs; they are anything but biologically appropriate for carnivores. Yes, dogs are carnivores, not herbivores or omnivores, like humans. While they are not obligate carnivores (as cats are), their bodies are designed to process and thrive on animal protein. In addition to the major issue of the appropriateness of a vegan food for dogs, we have other problems with the product’s concept. We agree that many factory farming practices in this country are outrageous and cruel, and we’d happily throw our support behind any pet food maker who offered a product that contained only certified cruelty-free animal proteins. But the claim that a product that is imported from Uruguay, is sold in small bags, and costs almost $3 a pound is “sustainable” is outrageous. For that price, you could feed your dog healthy local food, including meat from sustainable family farms and ranches, that will truly fulfill your dog’s nutritional needs. Update 1/28/12: It appears this food is no longer on the market, as their website (thehumanchoice.com) is invalid and a search did not turn up any current information on the food. Marion Nestle is the award-winning author of Pet Food Politics: The Chihuahua in the Coal Mine, the story of the massive pet food recall in 2007, and the upcoming Feed Your Pet Right: The Authoritative Guide to Feeding Your Dog and Cat, due out in May 2010. A renowned professor of nutrition, food studies and public health, Nestle’s interest in nutrition extends to both people and pets. In her Pet Food Politics blog, Nestle recently wrote about the limitations of nutrition analyses and databases as aids for creating healthy diets for people. I was surprised by how closely her words echoed my own feelings in relation to the drawbacks of relying on a single recipe developed with a spreadsheet to feed a dog. Exactly. Too many recipes created with spreadsheets, including those from veterinary nutritionists, provide only minimal amounts of important nutrients. If the foods used to create these recipes don’t match up to the numbers in the database, the recipes are likely to be lacking in some areas. Feeding the same recipe and nothing else for long periods of time may lead to nutritional deficiencies. The same problem can occur when you feed one commercial food exclusively. Even foods that state they are formulated to contain "complete and balanced" nutrition for dogs may not actually do so for a number of reasons. These include how the food is stored; changes in the ingredient sources; and whether laboratory analysis of the food itself was conducted to confirm its nutrient content (as opposed to tests of a similar food from its maker, or a feeding trial to determine its nutritional adequacy). I recommend choosing at least two or three different brands, using different protein sources, and rotating among them anywhere from daily to every few months. If one food is deficient in some areas, the odds are that the next food will make up for it, especially if it’s made by a different company -- though that food may be deficient in other areas. Spreadsheets have their place, especially when you need to control specific nutrients due to health problems. A spreadsheet can help you determine how to limit phosphorus in diets for dogs with kidney disease, for example. Even then, it's safer to use multiple recipes that include different ingredients rather than always feeding the same recipe. A spreadsheet should also be used if you’re feeding a single recipe for any reason, to identify any obvious nutritional imbalances. Food for thought indeed. Rather than relying on a single recipe created with a spreadsheet to ensure that your dog’s nutritional needs are being met, feed a wide variety of fresh foods in appropriate proportions; that's the best way to create a healthy diet for your dog, as well as for your family.